Ghana midfielder Sulley Muntari was an unused substitute in the Inter Milan set-up which beat TP Mazembe 3-0 to lift the FifaClub World Cup in Abu Dhabi on Saturday. Ghana midfielder Sulley Muntari was an unused substitute in the Inter Milan set-up which beat DR Congo side TP Mazembe 3-0 to lift the Fifa Club WorldCup in Abu Dhabi on Saturday. 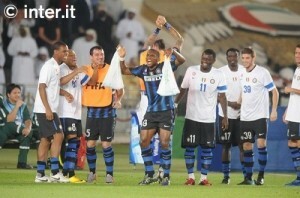 Muntari is the first Ghanaian player to win the tournament formerly known as the Fifa Club WorldChampionship Toyota Cup. Ex-Bayern Munich defender Sammy Kuffour won the Intercontinental Football Cup (contested between the winners of the European Cup and the South American Copa Libertadores) against Boca Juniors. The 28-year-old becomes one of the decorated Ghanaian players to play in Europe after winning the English FA Cup with Portsmouth and won the treble with Inter last season. Two goals in the space of four first half minutes put paid to the gallant African champions, with Goran Pandev and Samuel Eto’o’s clinical strikes providing the foundation for a victory that was later sealed by substitute Jonathan Biabiany.